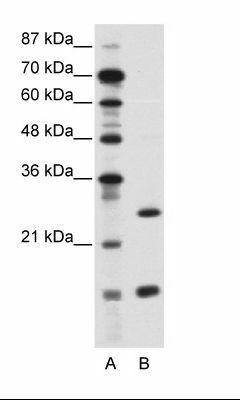 CEBP Gamma antibody LS-C432929 is an FITC-conjugated rabbit polyclonal antibody to CEBP Gamma (CEBPG) from human, chimpanzee, gibbon and other species. Validated for WB. 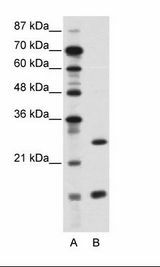 Synthetic peptide located between aa11-60 of human CEBPG (P53567, NP_001797). Percent identity by BLAST analysis: Human, Chimpanzee, Gorilla, Orangutan, Gibbon, Monkey, Marmoset (100%); Galago, Mouse, Rat, Elephant, Panda, Dog, Bovine, Bat, Rabbit, Horse, Platypus (92%); Pig, Opossum, Guinea pig, Zebra finch (85%).